0.250" (6.35mm) dia x 0.728" (18.50mm) long. Bullet Shape, South at tip, North at base, N50 Rare Earth Neodymium Cylinder / Rod Magnet, Magnetized thru length. Nickel Plated. 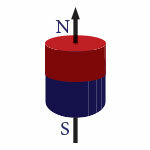 Neodymium Cylinder Bullet Magnets have a more concentrated magnetic field when magnetized through the length. This makes them a good option as a sensor magnet where the magnetic field needs more focus in a specific area, or in an application where a very targeted field is required.